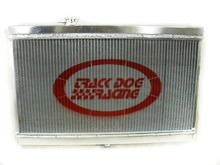 When choosing a radiator for your Miata there are many high performance models that are popular, In normally aspirated applications most of these would be a good improvement over stock. Some manufacturers also makes a larger and deeper radiators, but we do not recommend it for any Miata application due to its size and weight. For high performance applications such as Superchargers and Turbos the TDR radiator has outstanding features over many other brands and makes it our recommended choice for high performance radiators. Better Heat Transfer - 9 cooling fins per sq. in.